Earthquake location programs like PR-HYPO, the one used in the Puerto Rico Seismic Network (PRSN), need a realistic crustal model. Huerfano and Bataille (1994) proposed a flat homogeneous P-wave model for Puerto Rico and from Wadatti plots the Vp/Vs ratio was determined. The complete PRSN seismic catalogue was recompiled with this model so that all solutions are based on the same methodology. Criteria used to determine the data quality is the network stability. Time history analysis indicates that from 1992 to present the data obtained by the PRSN remains mostly stable as evidenced by the number of readings and location errors. During the time period from January 1987 to June 2002, 4422 microseismic records from the PRSN catalogue with quality A, B and C (local scale) were selected to determine the seismic potential in the LZPR (figure 4). Quality factors were based on the number of readings, root mean square (rms), hypocentral errors and azimuthal coverage (gap). These factors allow us to identify reliable solutions inside a specific region. Based on the offshore seismic distribution of shallow earthquakes (depth less that 50 km) and mapping of known fault systems, 11 sub-regions were proposed, each one defined by specific stress parameters (figures 5 and 6). Each region was previously analyzed by classic seismological methods like the Gutenberg and Richter b-value, Wells and Coppersmith relationships, composite stress patterns and the hypo-centering algorithm (Huerfano, 2003). Figure 5 shows composite mechanisms obtained by these methods, where the names assigned to each region depends on the predominant fault inside that sub-region. The Puerto Rico Trench (PRT) was subdivided into eastern and western sections due to intrinsic differences in seismicity and tectonics. Finally we characterized 238 spatially linear potential faults, each one generating their hypothetical earthquake. 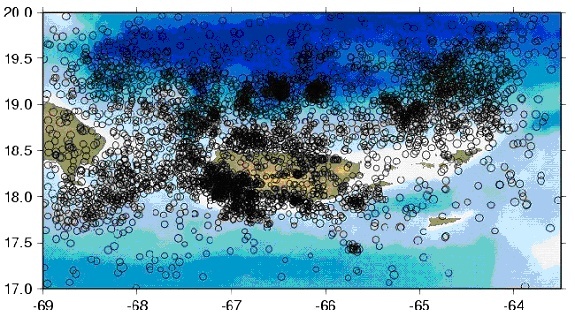 These sources were considered as local (relative to Puerto Rico) and it was found that the linear faults generate bigger tsunamis compared with the 102 spatially nonlinear or segmented faults which were also considered (Huerfano, 2003).